Lehman Catholic Science Olympiad team members who participated in the Regional Science Olympiad included (back row, l-r) Casey Topp, Mary Deafenbaugh, Joshua George, Rebecca Sanogo​, Ann Deafenbaugh, Nicholas Largent, Aaron Topp, (front row, l-r) Lexy Casillas, Joe Ritze, Max Schmiesing, Angela Brunner and Emily Bornhorst. Not Pictured: Elias Bezy, Jacquie Schemmel and Michael O’Leary. PIQUA – The Lehman Catholic Science Olympiad team competed in the Regional Science Olympiad held March 16 at Piqua High School for students from Shelby, Miami, Montgomery, Preble and Champaign counties. 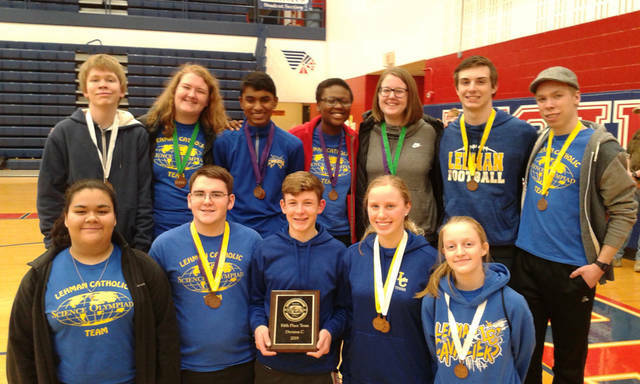 Lehman Catholic placed sixth out of 20 competing teams, fifth out of the competing schools and walked away with 11 medals, qualifying the team for the state Science Olympiad competition on April 27 at The Ohio State University. In Science Olympiad, students on each team compete individually or as part of a group in a series of events that test their knowledge of science skills, processes and applications in a wide range of disciplines including biology, chemistry, physics, technology, earth science and mathematics. Preparation starts in October and runs through March. The Lehman Catholic Science Olympiad program is coordinated by Sister Ginny Scherer. Olympiad coaches who volunteer their time are Tracy Hall, Leah Bertke, Jim Hemm, Tom Frantz, Tom Largent, Jon Snyder, Kim Wenning and Steve Wenning. Funding for the Lehman Catholic Science Olympiad program comes from the Miami County Community Foundation, a Copeland-Emerson Grant and the Lehman Catholic Science Department.